The origin of the English term “Ember Days” seems to be disputed. Some scholars claim it is merely a corruption of the Latin name “Quattuor Temporum – of the four times (or ‘seasons’)”, through the German “Quatember”, while others derive it from the Anglo-Saxon words “ymb-ryne”, meaning “regularly occurring.” English-speakers used also to refer to them as “Quarter tense”, another corruption of the Latin name. In German liturgical books of the Middle Ages, they are often called with an entirely different word, “angaria”; for example, the index of the 1498 Missal of Salzburg calls the Ember Days of Advent the “angaria hiemalis”, (i.e. of winter), those of Lent the “angaria vernalis” etc. This word derives from the verb “angariare – to press someone into service”, which occurs three times in the Latin New Testament. The first occurrence is in the Sermon on the Mount (Matthew 5, 41), “And whosoever will force thee one mile, go with him other two.” The other two are when Simon of Cyrene is forced to help the Lord carry His Cross, Matthew 27, 32 and its parallel in Mark 15, 21. The noun “angaria” therefore means “a pressing into service” or “exaction”; according to DuCange’s Medieval Latin Glossary, it was used in Germany to refer to a quarterly tax that was collected at the Ember Days. Missals and breviaries printed for use in Germany do however also regularly use the Latin “Quattuor Tempora”. 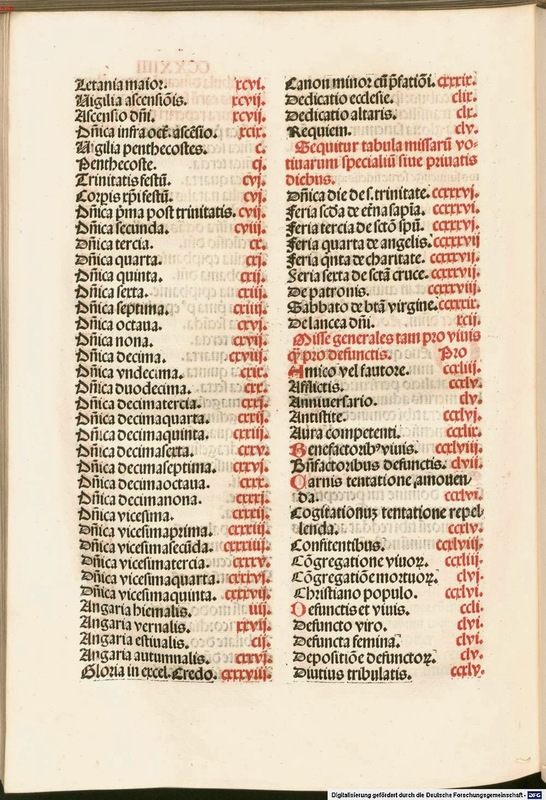 The index of the Missal of Salzburg, printed at Nuremburg in 1498. At the bottom of the left column are read “angaria hiemalis” etc. From the website of the Bayerische Staatsbibliothek in Munich. As I have noted previously, the Missal of Sarum has a different arrangement for this reading and its canticle on each of the four Ember Days. On Pentecost, the reading found in the Roman Missal, Daniel 3, 47-51, is lengthened by the addition of the Biblical canticle, chapter 3, 52-88; the addition is sung by the reader as part of the lesson, and not with the proper melody of the Benedictus es. 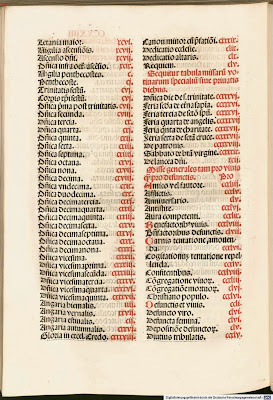 As is often the case with the lessons in medieval missals, the text does not correspond exactly to the wording of the Vulgate; there are a number of variants which derive from the Old Latin version of the Bible. Furthermore, several of the repetitions of “praise and exalt him above all forever” are omitted. The reading is then followed by the Alleluia and its verse as in the Roman Missal. In September, Sarum has the same reading as at Pentecost. It is followed, however by a canticle composed by the German monk, poet and scholar Walafrid Strabo, a student of Rabanus Maurus at the famous abbey of Fulda in the first half of the 9th century. This canticle is a poetic paraphrase of the Benedicite, each verse of which is followed by a refrain, “Let them ever adore the Almighty, and bless him through every age.” At Sarum, the refrain was sung with the verbs in the indicative, “They ever adore the Almighty, and bless him in every age.”; it is split into two parts, which are sung after alternate verses. There are a few other minor variants from Walafrid’s original version. Et benedicunt omne per aevum. - and bless Him through every age. Solque sororque, lumina caeli. - and the sun and his sister, the lights of heaven. Omnipotentem semper adorant. - They ever adore the Almighty. Ros pluviaeque, spiritus omnis. - the dew and the rains, and every wind. Frigus et ardor atque pruina. - chill and burning and the frost. Omnipotentem etc. - They adore etc. Lux tenebraeque, fulgura, nubes. - light and darkness, lightnings and clouds. Flumina, fontes, pontus et undae. - rivers, springs, the seas and the waves. vegetat aer, terraque nutrit. - that the air quickens, and the earth nourishes. Christicolaeque, servuli quique. - and the worshipers of Christ, and all His servants. Tresque pusilli exsuperantes - and the three little ones in their triumph. jussa tyranni temnere prompti. - of the fiery furnace, and the tyrant’s orders. lausque beato Flamini sacro. - and praise to the blessed Holy Spirit. 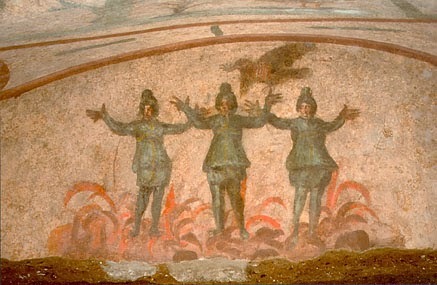 The Three Children in the Furnace, as depicted in the Catacomb of Priscilla in Rome ca. 275 A.D. The Ember Days are often said to be connected with the agricultural seasons, especially in reference to the harvest seasons of the Italian peninsula, since they originated in Rome. In point of fact, there are only a few references to harvests and harvest-offerings at Pentecost, only one in Lent (the first prophecy) and none at all in Advent. In September, on the other hand, the references to the harvest are very clear, especially in the Epistles of the Masses. On Wednesday, Amos 9, 13-15, on Friday, the end of the book of Hosea (14, 2-10) and the second reading from Leviticus on Saturday (23, 39-43) all speak of harvests and the fruits of the earth. The last of these prescribes that they be kept “starting on the fifteenth of the seventh month”; according to the Roman tradition, September was originally the seventh month of the calendar, and indeed, September 15th is the earliest day on which the first Ember Day can occur. On Wednesday is read the Gospel (Mark 9, 16-28) … about the deaf and mute (boy) whom the Apostles could not heal, since “that kind of demons is not cast out except in fasting and prayer”; which is fitting to this day. For today is the fast of the four times, and therefore two readings are read, so that the ordinands may be taught in the two precepts of charity, or in the two laws. The Mass of Saturday is all said for the teaching of the ordinands, lest they be sterile, like the fruitless fig tree, of which the Gospel is read (Luke 13, 6-17), and lest their lives be caught up in earthly matters, like the bent over woman. In the Epistle (Hebrews 9, 2-12), which treats of the first and second tabernacles, they are admonished to serve in the tabernacle of the Church Militant in such wise that they may be presented to the Lord in the tabernacle of the Church Triumphant. … Rightly in this month are the ordinations of clerics done, since in this month took place (in the Old Testament) the celebration of (the feast of) Tabernacles. Now the ordained are the ministers of the Church, established in the seven orders on the day of tabernacles through seven-fold grace.